This Romanian surplus 8mm Mauser ammunition is the perfect thing for range time with that classic 8mm rifle. This ammo comes packaged in a metal "spam Can" and the ammo is in the exact same condition as it was when it left the factory. Each round is loaded with a 150 grain FMJ bullet. This ammo is considered to be light ball, and the bullet might contain some mild steel. This ammo is loaded on 5 round stripper clips for fast loading and reloading, and the casings are lacquered and Berdan primed. Order your Spam Can of this "Romy" surplus today! Order was shipped super fast , superb ammo for my 8 mm yugo mauser, fires and cycles great and looks like it was made yesterday!And also received a spam can opener too!! This ammo shoots great through my MG34. I like this stuff because it is sealed in the "spam cans" and will last a long time if left unopened. It isnt 'terribly corrosive' but needs to be cleaned thoroughly soon after use. Warm water or soapy water drawn up thru the barrel by a wet patch will remove the salts. The bore can be rinsed and cleaned as normal. Warm water will evap quickly. Accuracy-wise it seems pretty good out to 300 yards (about my limit without a scope!). "Minute of man", no sweat. My main issue with this stuff is the bullet weight of 150 grains.. Mauser sights are regulated for the 190-200 grain Mauser military round, so the shooter needs to bear this in mind when using the stock mauser sights. In my book the recoil is less than the heavier bullet weights. It operates in some of my FN-49's better than the heavier ball so that's what I use it for. OK so I have a couple of weird FN49's, tis nevertheless true. There can't be much more of any 8mm layin around in European storage so it might be a good idea go get it while we can. I like the stuff and need to sit back a couple more tuna cans. To paraphrase "Spied's" review (12/04/15), military surplus, from whatever country, will provide extremely high performance.because of its intended use. I've used this ammo before in our 1940 Turkish K98 Mauser and had excellent results. We received the can in two days and I'm sure we won't be disappointed when we open the tin and send rounds down range. These are some quality rounds! good old military grade ammo buit to last and hit what you shot at. why I like military ammo. even in a dictator ship military grade ammo was not junk, actually the penalty for junk was harsh. 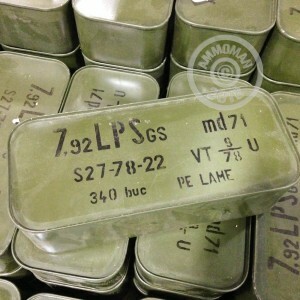 this is mil ammo and is not match grade, however it will do what it's suppose to do when it hits the target. after all, that is why it produced, so that you as the enemy do not walk away. so per round it is a deal both in price and in actual quality. Shoots well. A bit dirty and requires effort to feed into my M48 due to laquer coating. Otherwise a decent ammo for price.